A beautiful 'rosette' of Common Sorrel, positively glistening in the morning dew. I find myself hesitating to include Common Sorrel in this guide. 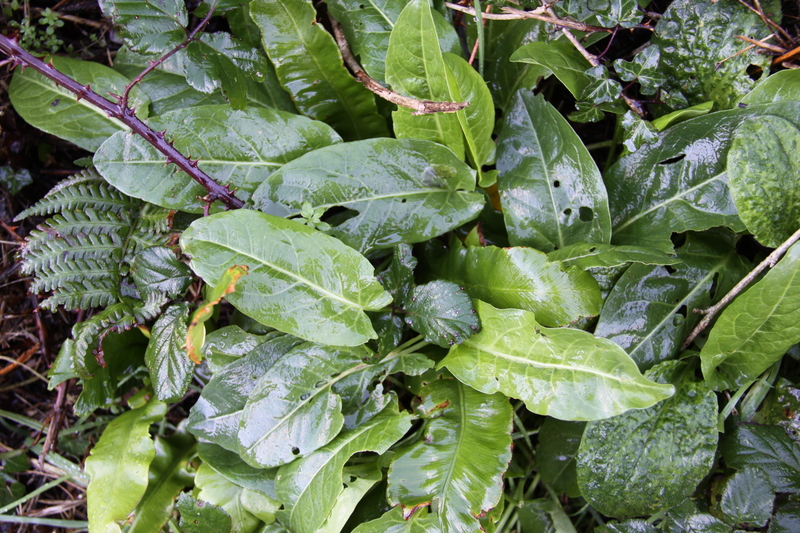 At first glance, Sorrel is everything the avid forager could hope for. It is certainly an abundant plant, growing in nearly all types of pasture, including meadows, roadsides and hedgerows. And the flavour is delectable: a citrusy, sherbetty sharpness not quite like anything else. 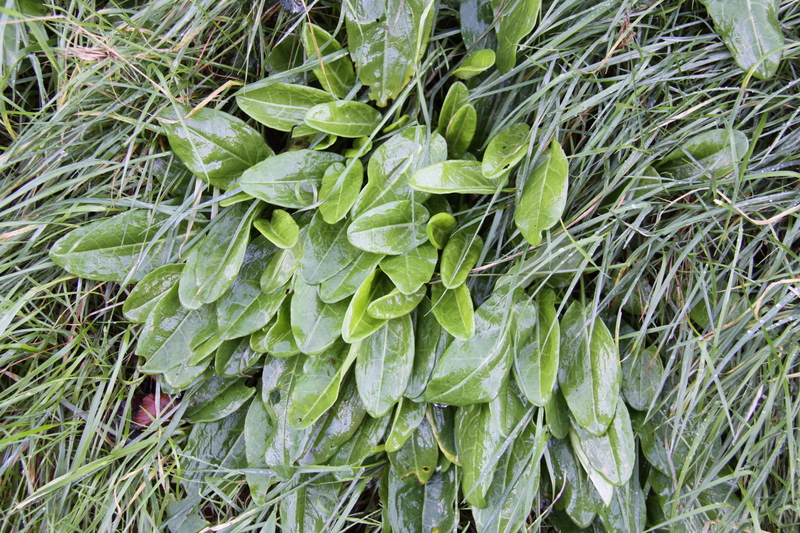 Another patch of Sorrel, but notice the other leaves growing amongst it: vigilant picking is essential to safe foraging. But, unfortunately, Common Sorrel does contain a certain amount of a substance that is, if consumed in any great quantity, in fact poisonous to us humans. The substance in question is oxalic acid and is indeed what gives the plant its distinctive sharp flavour. If one were to consume too much oxalic acid, then one has vomiting, muscular spasms, and in extreme cases cardiac arrest to look forward to. This seems positively frightful, but now that I have scared you, I will quickly reassure you that the amount of oxalic acid contained in Common Sorrel is actually very small, and so long as you don’t eat a basketful of the stuff every day then there really is no need to be too cautious. Indeed, if you treat it as a treat, a hearty helping of Sorrel soup every once in a while will do you no harm at all. Honestly. 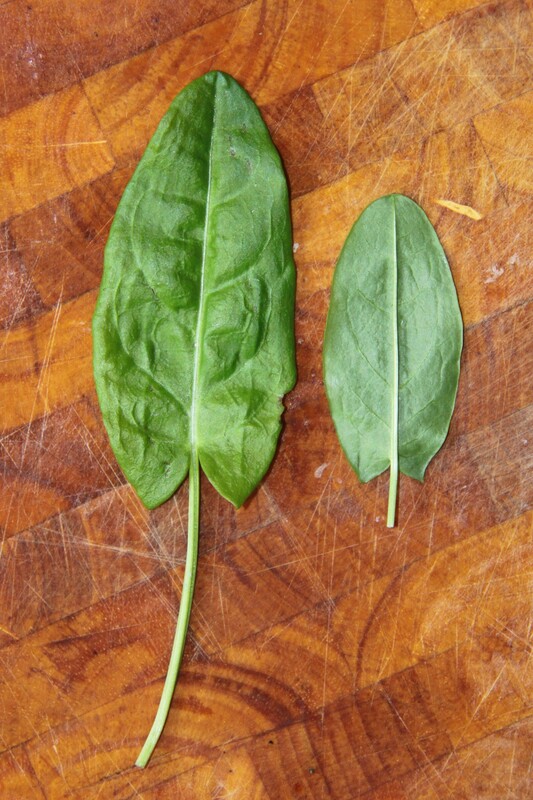 The arrow-shaped leaves of Common Sorrel, with the two pointed lobes pointing back down the stem. Common Sorrel is a very easy plant to identify, but, as always, you must be absolutely sure of what you’re picking. There are a couple of similar looking, mildly toxic docks that you wouldn’t want to end up eating accidentally. Thankfully, the leaves of Common Sorrel have one telltale feature that should always see you right. Notice on the picture opposite the lobes at the base of the leaf that point backwards down the stem. These lobes are always pointed on the Sorrel leaf, and if they appear rounded on what you have picked, you most likely have picked something else and must discard it. For further pictures and description, view my Edible Greens A-Z page. Sorrel Soup is perhaps the classic dish that is made from this piquant plant, but it also makes wonderful sauces, salads and omelettes. 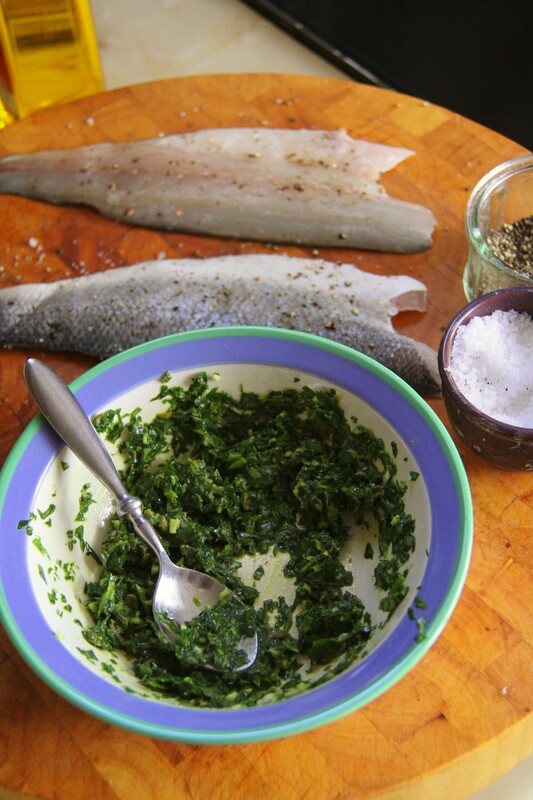 Try my Fried Sea Bass in Sorrel Salsa Verde for a real treat. This entry was posted in Edible Greens and tagged common sorrel, family activities, foraging, free food, oxalic acid, sorrel, wild food, wood sorrel. Bookmark the permalink.